Activities gardening many benefits. Especially beneficial for the health of the body, resulting in a healthy and beautiful environment. A house will certainly look nice when having a beautiful garden that contains a variety of beautiful plants. Do not waste your land or yard for a garden. Not only with various decorative tanamanan or different types of flowers and tree fruits , you can also make the garden a living pharmacy that will be useful for the whole family . Understanding life pharmacies are utilizing some of the land for cultivation of medicinal plants for everyday purposes. Generally known, that many traditional medicines that can be used to treat various diseases. Traditional medicine is generally more secure because it is natural and has fewer side effects than the drugs manufactured. That is why most people prefer taking traditional medicines. Imagine, if in your yard are available medicinal plants that can be used when one family member is sick. Of course it fun. You can just pick it up anytime, even though the night. No need to spend money and guaranteed freshness because plucked straight from the plant. Medicinal plants with no less beautiful ornamental plants. You can also plant it among the ornamental plants or flowers that exist. Apart from medicinal plants are generally more robust in the face of various diseases of plants as contain natural substances to cope, so you do not need to provide pesticides. 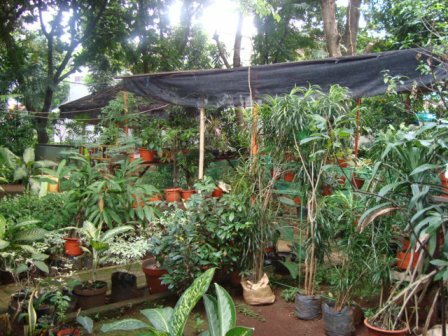 Thus, in order to make the pharmacy a wonderful and rewarding life there are some things to consider.For example, you need to menyerasikannya with plants and other elements in the park, so as not to damage the garden arrangement. You also need to know the benefits of each and how the use of medicinal plants accordingly. In the early days, the treatment at home with medicinal plants found to try and learn from mistakes (trial and error). Currently, extracts of several medicinal plants have been used for the treatment of the modern era and is useful for curing many serious diseases. Aloe vera or aloe vera has long been recognized as a hair fertilizer plant. Another benefit is that it can relieve cough. Known for having a good antiseptic content. You can also use it to relieve cough. In addition to the kitchen as a spice, ginger can cure skin fungus on the skin. Useful to overcome the jaundice. If anyone in the family hot, use cumin leaves to reduce the heat. Useful also for the launch of breastfeeding for mothers who are breastfeeding. Can be used to cure coughs and rheumatism because it produces a sense of warmth. These famous herbs are also useful for treating colds. Plants that have been known as a medicinal plant. Can cure high blood diseases. Can be used to relieve back pain. The bitter taste is believed to cure various diseases. You can use the leaves to cure diseases and typhoid fever. Fruit is beneficial for the body a lot. By eating the fruit can relieve osteoporosis. Fruit acids can be used to relieve cough. An ornamental plant, but also has benefits to cope with menstrual pain. Also a common ornamental plant grown in the garden because the leaves are colorful. Can be utilized green leaves are yellow to warm the stomach. Beautiful flower whose fragrance is often used as a perfume raw material, apparently including medicinal plants. Savor the leaves can cure shortness of breath and headaches. The flowers can be used to treat eye inflammation. Bay leaf boiled water is able to overcome ulcer disease and is also capable of lowering blood sugar levels quickly so good for people with diabetes . Guava also has properties. The leaves can be used to treat constipation or diarrhea diseases. The function of the leaves are able to make the hard stools, thereby reducing the bowel. Fruit juice is also good for health because they contain lots of vitamin C and good for patients such as dengue fever. Seeing the many benefits of living pharmacy, can certainly move you to utilize the existing land at home.Parks can provide a psychological effect for people who are sick and recover faster. Caring for your plants also become a means of moving the body and exercise. The result of the body to be healthy and beautiful . If your home does not have large land do not despair, use pot as a planting medium. By having a living pharmacy, home to beautiful, beautiful, healthy and can save money to buy drugs or herbs. Medicinal plants would make sense for you and your family.